Sekisui House has announced that it has received Development Approval at their $750million award-winning ‘The Hermitage’ in Gledswood Hills, NSW for an $11million premium 9-hole Par 3 golf course and driving range, the first of its kind in Australia to be created by golf legend Greg Norman. The new golf course to Sydney’s south-west is a collaboration between Sekisui House, Greg Norman Golf Course Design and club operator, Wests Campbelltown. Stretching over 1,365 metres, with an average distance of 152 metres for each hole, the golf course will also include a commercial driving range and practice facilities. Construction is anticipated to commence in mid-2016, with a public opening earmarked for early 2018. First established in 1987, Greg Norman Golf Course Design is today recognised as one of the premier signature golf course design firms in the world, having opened more than 90 courses globally. Reflecting Sekisui House’s core philosophy to work and live harmoniously with natural environments, the golf course design will feature Greg Norman’s signature sustainable design principles, paying respect to the existing topography of the land, heritage of the site and biodiversity conservation. 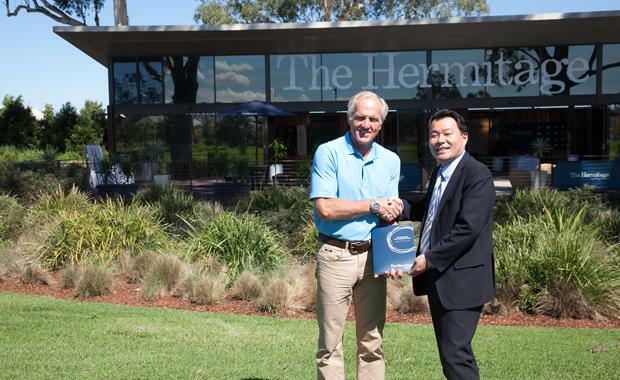 Toru Abe, CEO and Managing Director of Sekisui House Australia added, “The partnership with Mr Norman to create a world-class golfing experience at The Hermitage, is not just a reflection of our commitment to our valued customers, but also a reflection of our corporate philosophy. We believe that modern life can share an affinity with the land, appreciating natural open green spaces to help raise the quality of life for many Australians for generations to come." Greg Norman executed the agreement with Sekisui House Limited Executive Vice President, Sumio Wada (Centre), Sekisui House CEO and Managing Director, Toru Abe (Left). [/caption]Since the launch of The Hermitage in 2012, Sekisui House has sold more than 870 lots. The Hermitage will feature 35 hectares of open green space and established trees, 10 distinct park locations, two golf courses including an 18 and 9 hole golf course set over 120 hectares, a new public primary school accommodating up to 1,000 pupils and the future ‘Gledswood Village’ that will include amenities including groceries, cafes, health care, a country club and restaurants. Easily accessible by the M5 and M7 freeways, The Hermitage is located approximately 55km from Sydney’s CBD, 20km from Liverpool and 35km from Parramatta and Penrith. It will have a projected population of over 6,000 people living within 2,000 homes and completion is expected in 2022.